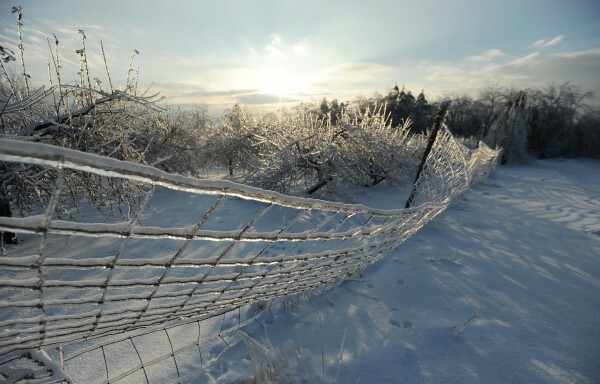 A fence enclosing an orchard near Bor Way in Ellsworth bends under the weight of ice on Dec. 28. AUGUSTA, Maine — The federal government has denied a request by Gov. Paul LePage to declare the December 2013 ice storm a major disaster and release funding to reimburse cities, towns and state agencies for the cost of the disaster. In a release Thursday, LePage said he was disappointed in the decision by the Federal Emergency Management Agency, but no appeal would be filed. In a Feb. 21 letter to Paul Ford, acting regional administrator for the Federal Emergency Management Agency’s Boston office, LePage wrote that estimates for the storm damage at that time were more than $1.9 million. The figure just exceeded the threshold the state is expected to meet in order to be considered for a major disaster declaration, according to Lynette Miller, Maine Emergency Management Agency spokeswoman. LePage wrote of damage caused by “the severe winter storm, extreme cold, wind and wind chills” during the storm, which lasted Dec. 21, 2013, to Jan. 1, 2014. The governor requested that all 16 counties in the state be included in the disaster aid declaration but expected to receive aid initially for Waldo and Washington counties, Miller wrote in an email to the Bangor Daily News. “The nature of this emergency was the extreme threat to public safety caused by widespread power outages and debris and ice-covered roads, during a period of extreme cold which put lives at jeopardy and rendered usual means of road treatment ineffective,” LePage wrote, in part. Miller said the largest cost — road treatment — could not be included in the request because of FEMA’s “narrow winter storm policy,” and other additional costs dropped the state below the eligibility threshold. The most significant consequence of the decision not to declare the state a disaster area will be felt by cities and towns that spent significant funds on road treatment, debris clearing and other emergency services, according to Miller. The Eastern Maine Electric Cooperative, a consumer-owned utility that operates primarily in Washington County “was very hard-hit,” Miller said. Central Maine Power and Emera Maine are not eligible for funding because the companies are privately owned. In Thursday’s release announcing the denial of federal aid, LePage wrote that his administration learned of the rejection on March 12. The Small Business Administration did grant LePage’s request for low-interest economic injury loans to assist businesses that lost revenue as a result of the storm, according to the release. Business owners can apply online for loans at disasterloan.sba.gov/ela or call the SBA for more information at 800-659-2955 or 800-877-8339 for the deaf and hearing impaired.